When you are looking for the best noise cancelling headphones, there are a lot of things in your mind. You cannot simply point your finger at one, and buy it in the end. The noise cancelling headphones are getting better and better as the time progresses. Sony has now dethroned Bose in terms of noise cancelling, and sound quality. Simply put, the market is more saturated than it has ever been. With big names like Sony, Bose, and Sennheiser prowling the market, and releasing some of the most compelling and great headphones for everyone. Now if you are an average Joe, or an average Jane, you might have a difficult time finding the best possible headphones you can buy. Simply because the number of options are way too much, and if you are not familiar with how the best possible headphone is purchased, then you are going to need some help. In this list, we are going to take a look at the best noise canceling headphones that you can buy. To keep things simple and avoid any confusions, we are only looking at 5 headphones. This will ensure that people do not have a hard time buying a pair. Sony’s original MDR-1000X was met with a warm response for music lovers in the world. However, after a year, the company released the mark two if the same headphones dubbed Sony WH-1000XM2. While this was largely and iterative upgrade over the original, there were some improvements across the board that Sony added. For starters, the headphones still maintain the excellent sound stage of the original, and the industry leading noise cancellation is still there. The original had some issues with the build quality, and Sony has fixed that issue as well. The biggest change, however, comes in the shape of the battery life. As compared to the original 24 hours of battery of the MDR-1000X, the WH-1000XM2 are capable of providing 30 hours of battery life on a single charge. That is not all, the headphones can now be controlled through a companion app that has some neat features, especially for people who commute a lot. There is nothing wrong with the Sony WH-1000XM2 that can actually break the overall experience. However, if you are planning on using it for making calls strictly, you might realise that as a headset, the performance could have been better. Lastly, the battery is not user replaceable. 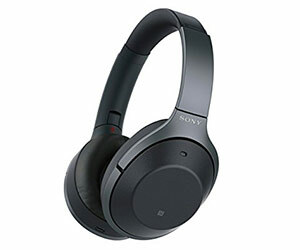 Overall, the Sony WH-1000XM2 is one of the best noise cancelling headphones in the market despite not having a user replaceable battery. Noise cancellation is the best in the market. 30-hour battery life is an impressive feature. Comes with a carrying case, and all the necessities. Improved build quality over the original. As a headset, the Sony WH-1000XM2 does not perform that well. For the longest time, the Boise QuiteComfort 35 were considered the best noise cancelling headphones available in the market. They were soon dethroned by the Sony MDR-1000X. However, Bose was not going to sit quietly, and they launched the much hyped Bose QuiteComfort 35 II. While the headphones look the same as their original counterpart, there are some improvements under the hood. 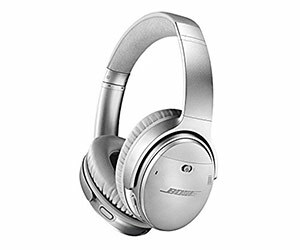 For starters, Bose has worked hard to improve the battery life, and the noise cancellation. The sound quality is largely the same, and I am not complaining as the Bose QuiteComfort 35 II are still one of the best sounding, balanced headphones you can buy. The comfort level is still unparalleled, so much so that you can wear the headphones for hours without having any issues whatsoever. Not everything is fine and dandy. Despite costing the same as some of the competition, the sound quality is not as good as we would like; the sound is balanced, yes. However, it will not blow your socks off. Additionally, the design language is largely the same, and Bose is still using physical buttons, rather than opting for touch controls. Overall, the Bose QuiteComfort 35 II are great when it comes to being comfortable, or delivering exceptional noise cancellation. However, even when they are sounding good, the sound quality is nothing that you can call exceptional. The headphones are also held back by an old design, as well as physical buttons in an age where headphones are using touch controls for the most part. One of the best noise cancellations. The sound quality is just okay. When it comes to headphones in general, Sennheiser is no stranger to the market. The same goes for the wireless headphones because the company has released some exceptional wireless headphones over the past couple of years. Today, we look at the Sennheiser PXC 550 Wireless basking in its wireless glory. Sennheiser released these to jump to the right between Sony, and Bose. Now the thing about PXC 550 wireless is that they sound really good for the price you are paying. They are certainly priced a bit higher than the rest of the options available in the market. Additionally, the noise cancellation is pretty good, and I love the touch controls on the right ear cup. I also love how these headphones come with the companion app that provide you a granular control over how you want the sound to be. As a headset, the Sennheiser PXC 550 Wireless delivers excellent performance as well, so you really do not have to worry. While the headphones sound excellent, the biggest drawback is that the sound lacks some detail. It might not be noticeable easily, but keen eared users will be able to hear the discrepancies. Overall, the Sennheiser PXC 550 Wireless is an excellent choice for those looking to enjoy the music to the fullest. Exceptional battery life, great ergonomics, and good sound are just some of the things that you get from this headphone. However, it is only, slightly held back by the fact that the sound on these headphones is not as detailed. The touch controls are great. The sound is not as detailed. 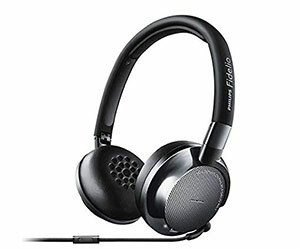 Philips is not really a company you hear about whenever you are in the market looking for a good pair of noise cancellation headphones. However, let’s not forget that the company is behind releasing some of the best headphones, and other entertainment related products in the market. Today, we look at the Philips Fidelio NC1; company’s noise cancellation earphones that do not offer wireless capability but are still amazing. Now the thing that you need to know is that these are not over year headphones, these are on-ear headphones, so there is a chance of sound leaking outside, and outside noise coming in. This is where the noise cancellation part comes in. I am surprised with the job Philips has done designing the sound quality of the headset; it is truly one of the best I have seen. The build quality is another strong point of this headphones, and the sound is balanced to a point where you won’t feel like you are missing out anything as far as music is concerned. Despite all the good things, there are a few things that I would like to mention. For starters, due to the way these headphones are designed, there is some sound leakage that you will have to deal with. Overall, the Philips Fidelio NC1 are a great pair of headphones that sound amazing, has great build quality, and come with active noise cancellation as well. The only way they lack is because of the way they are designed. Great sound quality that is very balanced. The active noise cancellation is pretty good. The design allows some sound to leak out of the headphones. 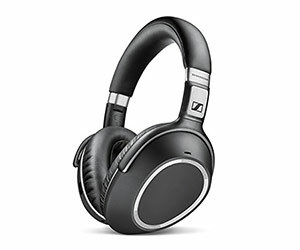 The last pair of headphones that we are reviewing is from none other than Sennheiser. Of course, we have reviewed the PXC 550 before, but this time, we are looking for something that is on the cheaper end. However, do not let the price fool you because even with the lower price tag, the headphones do offer a pretty decent performance to begin with. We are looking at the Sennheiser HD 4.50 BTNC. Now the thing about these headphones is that they are wireless, and they do offer you active noise cancellation as well. I was skeptical when I thought about testing them out, and surprisingly, these headphones are a lot better than what I had expected. The sound quality is great, the active noise cancellation works surprisingly well. The design of the Sennheiser HD 4.50 BTNC is pretty nice, and the headphones are easier to carry without any issue whatsoever. The price, is one of the biggest selling point as well. There are some great things about the Sennheiser HD 4.50 BTNC, however, the headband itself does not have enough padding. Additionally, wearing the headphones for long can heat up your ears due to the lack of ventilation on the earpads. 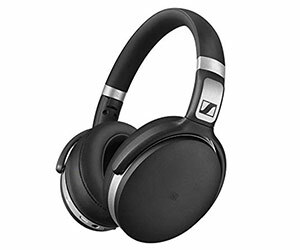 Overall, the Sennheiser HD 4.50 BTNC are pretty great, and relatively cheap active noise cancellation headphones that you should definitely have a look at. The sound quality is pretty good. The design is well made, and travel friendly. 20 hours battery life is rather promising. The active noise cancellation is great. The headband lack additional padding. Wearing the headphones for long can warm up your ears. Finding the best noise cancelling headphone is not something that you can easily do. Especially now that the market is super saturated, and you can’t really find the best possible option with ease. However, with this round up, the whole process of finding the best possible noise cancelling headphone has become much easier. The reason why we did a list of only 5 headphones instead of the traditional top 10 is because the more options there are, the more confusing it becomes. However, the 5 headphones that we have reviewed are some of the best in the industry, and I can guarantee that you are going to love listening to music on them. If you are looking for the best overall headphone from the list, then there is not a single option in the list that can match the Sony-WH1000XM2. Everything about that pair is class leading, and the best part is that that the headphones are priced accordingly as well. Needless to say, you are not going to find a better pair of headphones in that price.